For those of you who have been living in a cave for the last few months, here is what Clay, Jeff, Halldor and I have been up to. Check out the page here. 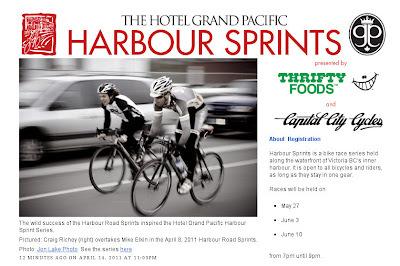 The Hotel Grand Pacific Harbour Sprint Series is one event in the upcoming Victoria International Cycling Festival (VICF). I will let the hyperlinks do the talking.